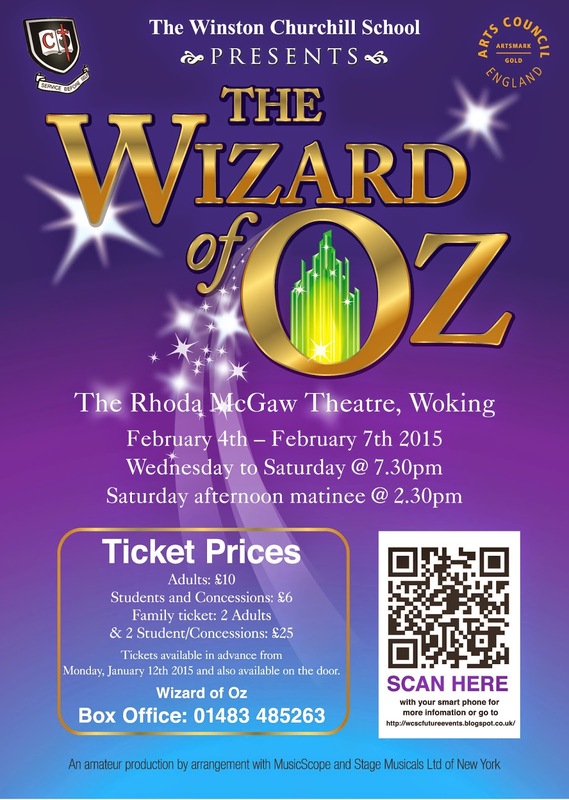 Click your heels, make a wish and follow the Winston Churchill School along the Yellow Brick Road to the Rhoda McGaw Theatre for this hugely popular family musical, running from February 4th – 7th 2015. When a twister transports Dorothy and her dog Toto to a magical land over the rainbow, she teams up with the Scarecrow, Tin Man and Cowardly Lion to fight the Wicked Witch of the West and find the Wonderful Wizard of Oz. Dorothy meets the Munchkins, braves the Haunted Forest and encounters Flying Monkeys on her way to the Emerald City where she finally learns that “There’s No Place Like Home’. Family Ticket; 2 Adults/2 Students/Concessions; £25. Purchase your ticket through Tucasi if you have an account through the school . Having paid for your tickets online, your son/daughter must then go to Mrs Cotter in the Pastoral Office Box Office ( Box Office open from 2.55pm every day ) to select your seats for your chosen performance, bringing with them proof of payment, in the form of the confirmation e-mail from Tucasi. If you have any specific seating requests for any of the performances, please can you state this clearly on the confirmation e-mail so that Mrs Cotter is able to deal with your requests immediately. If you do not have a Tucasi account through the school please telephone the Wizard of OZ box office on 01483 485263. I do hope you will be able to join us at The Rhoda McGaw Theatre.